In season two of Genndy Tartakovsky's Star Wars: Clone Wars animated series, Padme Amidala and Yoda undertake a mission to rescue Jedi Master Luminara Unduli and her Padawan Barris Offee on the planet Ilum. Ilum is an ice planet with caves that contain crystals the Jedi use to make their lightsabers. Amidala wears cold weather gear to operate in the frigid environment. 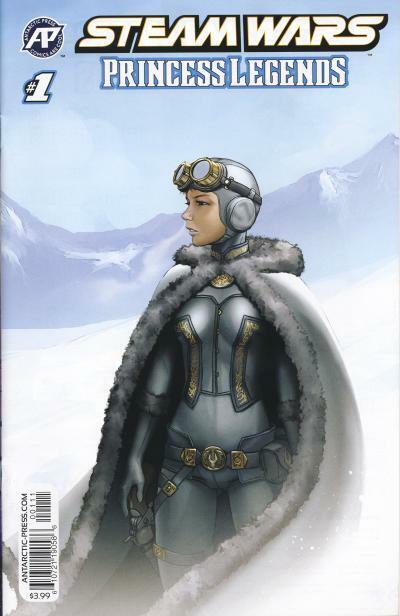 The cover for Antartic Press' Steam Wars: Princess Legends #1 shows a character who is wearing cold gear similar to the outfit worn by Amidala. The outfit for the character on this cover is more ornate however, and this character wears a head piece and goggles that Amidala's outfit did not have. 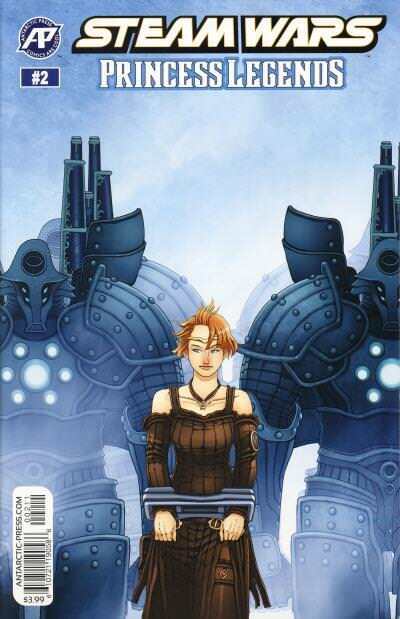 The cover for Steam Wars: Princess Legends #2 shows a female character in shackles, flanked by several heavily armored guards. 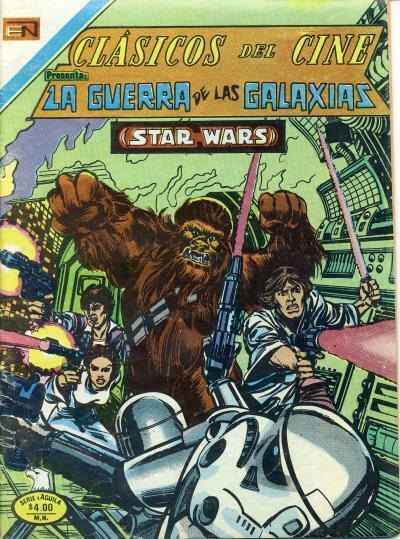 Unlike many of the covers used for the Steam Wars comics, this cover has no direct Star Wars reference. His appearance as a large, slug-like alien is taken for granted today, but from his mention in the first two Star Wars movies until his first appearance in the third movie, the image many Star Wars comic fans had of Jabba the Hutt were based on Marvel's adaptation of the Star Wars movie. The adaptation includes a deleted scene where Jabba confronts Han Solo at Docking Bay 94 on Tatooine. In that scene, Jabba is drawn to look like the character Mosep, a walrus faced alien seen in the background in Mos Eisley. This version of Jabba would appear twice more, in Star Wars #28 and 37. 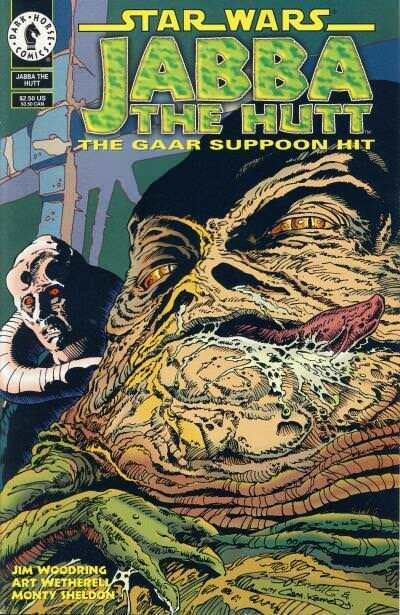 Jabba the Hutt is an unlikely character to star in his own comic book, but Dark Horse did just that in a series of four one-shots they published starting in April 1995. The first one-shot is titled Jabba the Hutt - The Gaar Suppoon Hit and tells a story of Jabba negotiating with his rival Gaar Suppoon. The comic shows the two gangsters one-upping each other during their dealings, but in the end, Jabba comes out on top and Gaar is killed. The story is surprisingly engaging and fun, proving to be a quintessential look at Jabba that works well for the character. The cover is a nice depiction of Jabba and his majordomo Bib Fortuna. The interior artist Art Wetherell does a decent job of drawing the various aliens that serve Jabba and Gaar in a not-overly cartoonish manner, despite some of the outlandish events that occur. Like Darth Vader #1, Darth Vader #2 and 3 are going back to print. The 2nd prints are scheduled to be in stores August 23rd. This is old news from the San Diego Comic-Con last week, but Marvel will be adapting Timothy Zahn's Thrawn novel. The adaptation will start in February 2018 and run for 6 issues. In Marvel's second Star Wars story arc, Showdown on a Smuggler's Moon, Luke Skywalker is captured by Grakkus the Hutt on Nar Shaddaa. 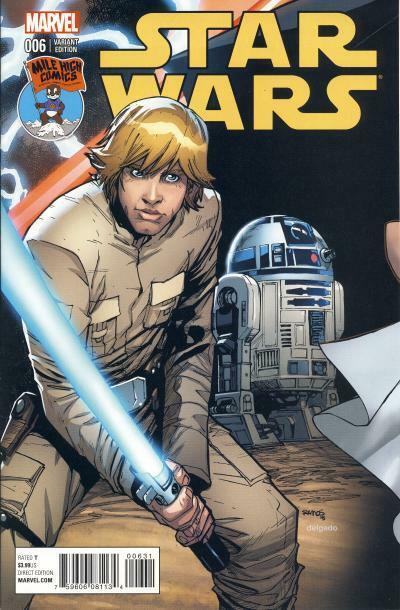 In Star Wars #10, Luke Skywalker is trained by the lightsaber wielding Gamemaster to fight in Grakkus' arena. In Star Wars #11 and 12, Luke battles in the arena and just as Luke' opponent is about to kill him, the Gamemaster saves Luke. The Gamemaster is revealed to be Sergeant Kreel, an Imperial Stormtrooper and spy, positioned in Grakkus' organization to take down the crime lord. Kreel reports directly to Darth Vader and is known as Vader's Fist and he intends to turn Luke over to Vader, but Luke manages to escape. The next time we see Sergeant Kreel, he is leading a squadron of Stormtroopers who are investigating the recently abandoned Sunspot Prison in the final two pages of the final issue of the Rebel Jail arc. 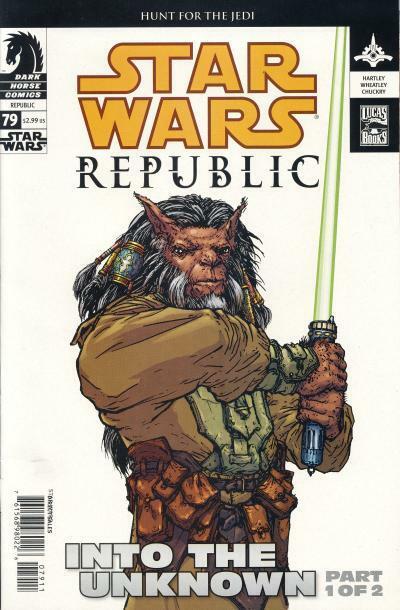 On the last page of Star Wars #19, Kreel is shown wielding his lit green lightsaber flanked by two uniquely outfitted Stormtroopers as Kreel exclaims "Who's ready to kill some Rebels?" 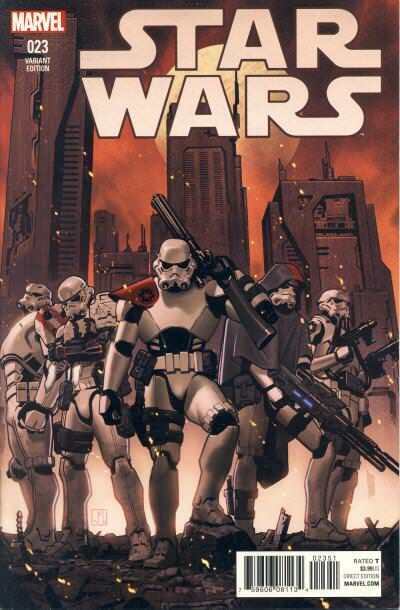 Special Commando Advanced Recon or SCAR Squadron are the main focus of Star Wars #21, the first issue of The Last Flight of the Harbinger arc. Led by Sergeant Kreel, SCAR Squadron is made up of an elite group of Stormtroopers who each possess unique skills, armor, and weapons. In issue #21, the squadron is sent to the Ghost Moon to take down a band of Rebels and the issue is told from the Kreel's point of view and highlights the talents of the individual members of the squadron. 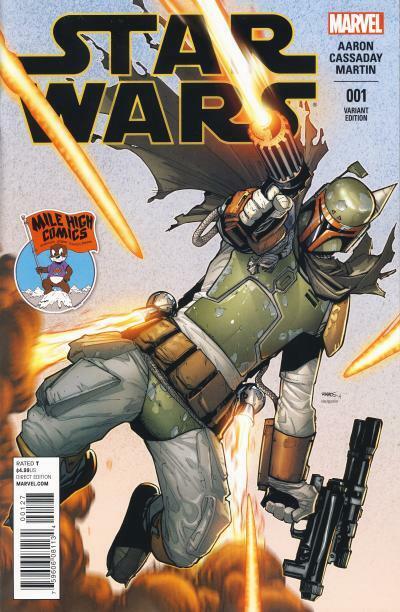 The Jorge Molina variant cover for Star Wars #23 is the first cover appearance of SCAR Squadron. This cover was initially released in a 1:25 ratio. SCAR Squadron will be making an appearance in Star Wars #37. Neff Headwear started in 2002 as a maker of beanies for snowboarders and skaters. They have expanded from selling headwear in a single shop in Utah to selling headwear and other apparel in over 45 countries and online. 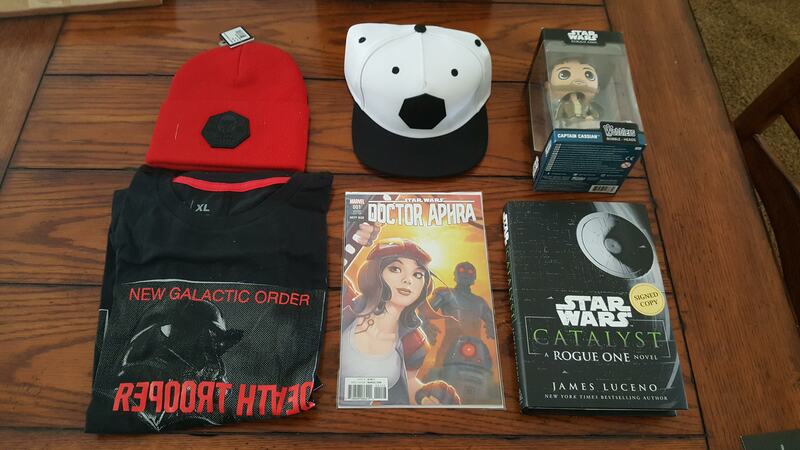 In December 2016, they offered licensed apparel for Rogue One available in a limited edition box which includes an exclusive cover for Doctor Aphra #1. 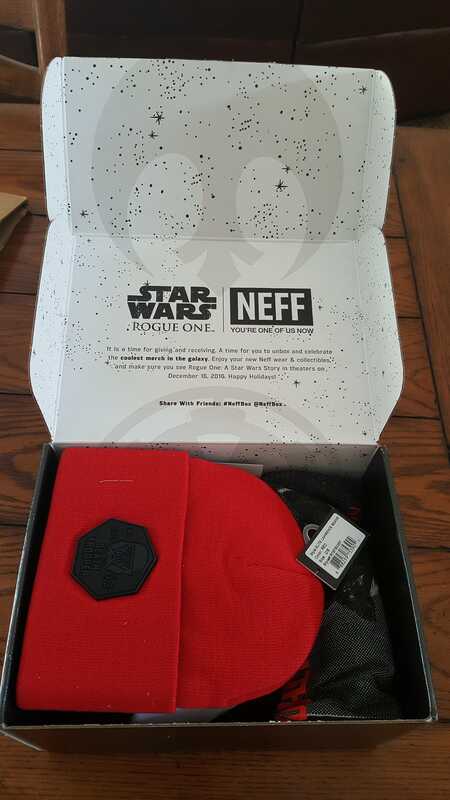 This is the only Neff Box offered to date and despite being limited, this box can still be order at neffbox.com. In the months this box has been available, there have been online coupons which makes the price more appealing to purchase, especially if you are only interested in the comic. 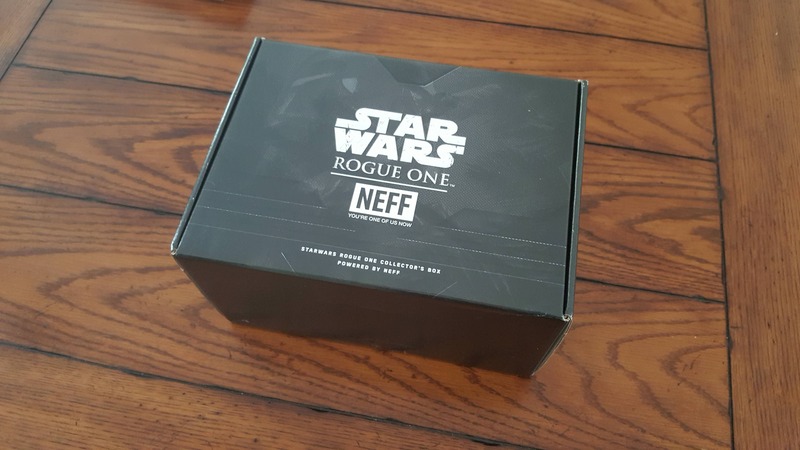 The Rogue One items are packed in an attractive black box clearly branded for Rogue One and Neff Headwear. Overall, I was only interested in the comic book and the novel, but I will definitely wear the t-shirt and the baseball cap. Since I live in Phoenix, there won't many opportunities to use the beanie as it does not get cold enough here. I also do not collect the Funko bobbleheads. Overall, the $99 price for this box is about twice what I would spend on the items I wanted and will use, so it was definitely prudent to use a coupon before making the purchase. The Doctor Aphra #1 exclusive cover is by David Nakayama. 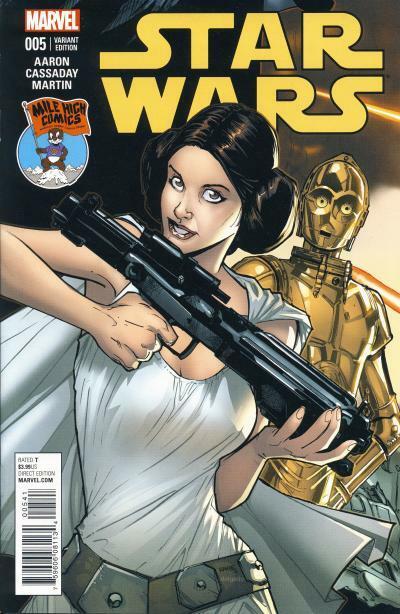 Nakayama's first comic work was penciling the 6 page story The Apprentice in Star Wars Tales #17. Not many of these comics have sold on eBay, but one is currently listed at $80. Since this is still available from the source, it would be cheaper to use a coupon to purchase the box to get the comic, plus you will also receive other items. Comichron released the June 2017 estimated sales last week. 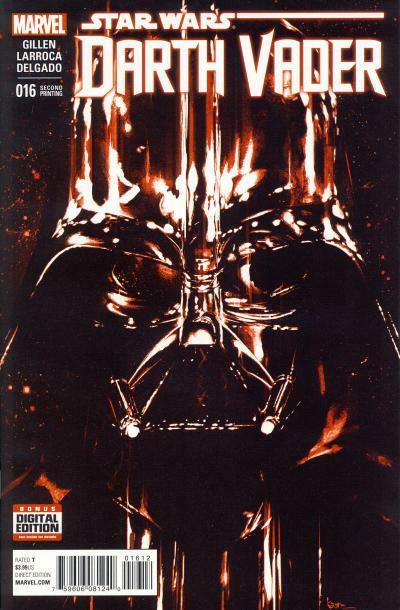 Darth Vader returned to shelves and the second volume debuted at #3 on the chart. Star Wars remains Marvel's best selling ongoing title. The big news for June is the return of an ongoing Darth Vader title to the Star Wars line of books. Issue #1 sold over 118,000 copies, but issue #2 fell 44% to move just over 66,000 copies. In comparison, the lowest selling issue from the first volume was #24 which sold over 75,000 units. I suspect retailers under ordered Darth Vader #2 and we'll see higher numbers for the third issue. Sales on the main Star Wars title remain relatively flat despite issue #32 being part of the Screaming Citadel event. Despite a modest gain last month, Doctor Aphra saw a much better 14.75% gain in unit sales this month due to the event. 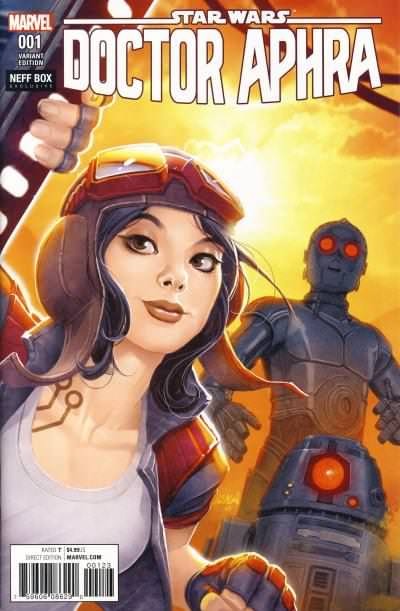 If the Doctor Aphra title can hold on to some of these gains next month, this will be very positive for this title which had been drifting down into Poe Dameron numbers. Poe Dameron #16 saw a slight rebound off last month's all time low. The Poe Dameron Annual which reads like a slightly longer version of a standard issue sold in similar numbers. I'm predicting this title will survive until The Last Jedi movie is released in December, but I anticipate it will be either replaced or have a completely new direction at that time. The Droids Unplugged one-shot which contains reprints of backup droid stories sold just as well as this ongoing title. 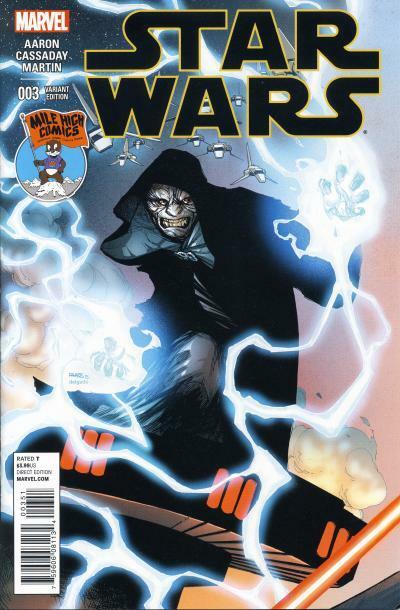 Darth Maul #4 saw an increase in units sold of approximately 6%. This mini-series has been very well received, on par with the Han Solo mini-series from last year. Rogue One #3 sold over 3,000 less units this month. There is a Cassian & K2SO one-shot coming based on characters from the movie which should sell better. In a couple of months, IDW will begin selling an all-age Star Wars title, Star Wars Adventures. With Marvel ramping up the number of Star Wars comic offerings (Mace Windu, Captain Phasma, and Thrawn mini-series as well as a Doctor Aphra and Star Wars Annual are forthcoming), it will be interesting to see if there is demand for the increased number of Star Wars comic offerings. While Star Wars Adventures is aimed at a younger reader than Marvel's line, a large number of Marvel's readers will be trying the IDW title. The average sale per issue of 55,065 would rank 20th on the top 300 chart for the month of June. Star Wars trade paperbacks, reprint titles, and reorders are not accounted for with these numbers. The Star Wars trade paperbacks are strong sellers. Take a look at the Star Wars Sales Estimate Chart and please read the blog posting June 2017 comics estimates: Average comic offered tops $4 for first time; our 250th consecutive monthly report! 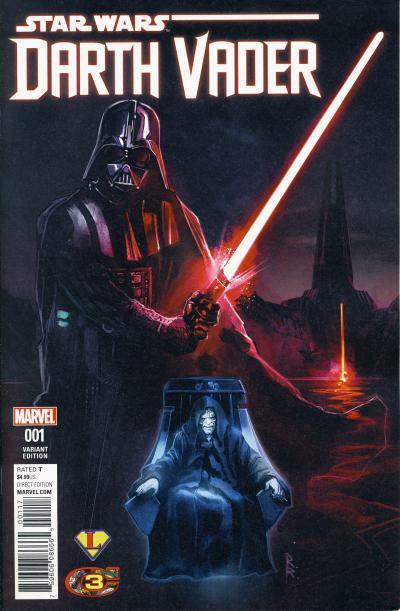 The Vader Down event sold very well for Marvel increasing the number of copies sold for the tie-in issues. 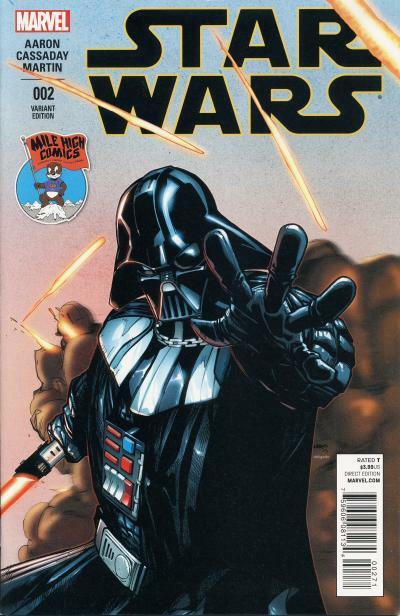 In fact, the two Star Wars and three Darth Vader tie-in issues went back to print. Usually, after an event, subsequent issues see a decrease in sales. 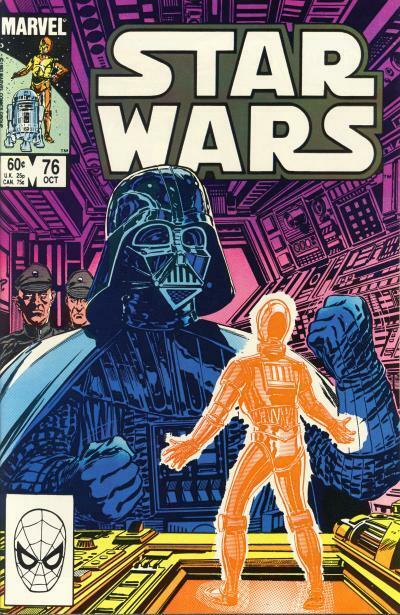 The issues immediately after the Vader Down story arc ended, Star Wars #15 and Darth Vader #16, went back to print as well. From the numbers published by Comichron, it appears retailers scaled back the number of issues ordered by too much and these issues were under-ordered. 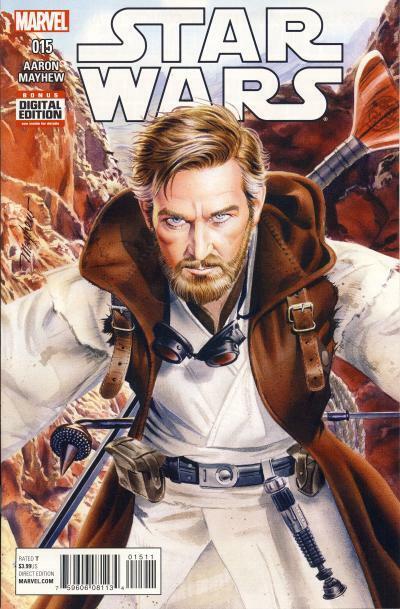 Star Wars #15 has another tale of Obi-Wan Kenobi on Tatooine. 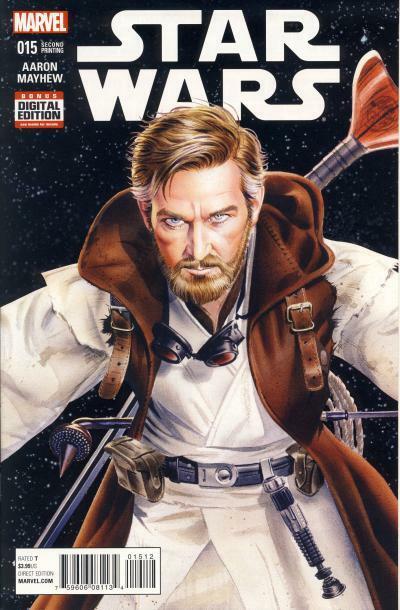 The standard cover shows Obi-Wan. The 2nd print cover is a variant of the same art, except the background has now been replaced with a star field. Many of the 2nd prints from Marvel have used a star field background. Darth Vader #16 jumps back into the narrative by returning Vader to Shu-Torun to quell a rebellion. The cover is a nice piece showing Darth Vader's head. His polished armor is emitting a lot of shine. The 2nd print cover is the same artwork, except Darth Vader is lit by red light. 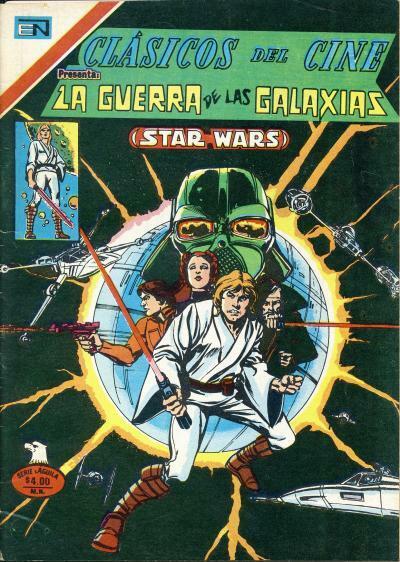 Brown Watson published the first Star Wars Annual for British readers in 1978. 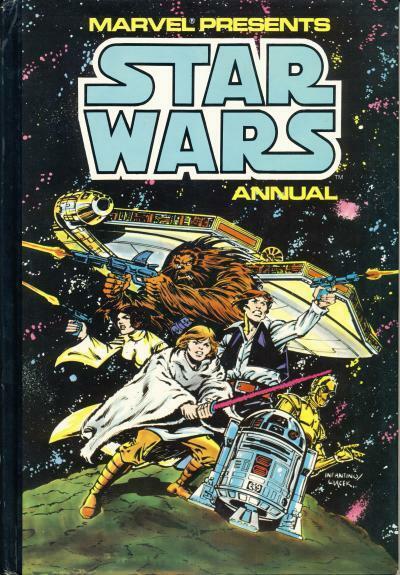 In 1979, the Star Wars Annual was published by Grandreams. The content of this hardcover book includes Star Wars #13 and 14.
contains Star Wars #13 and 14. I don't recall the cover artwork being used in a U.S. comic. 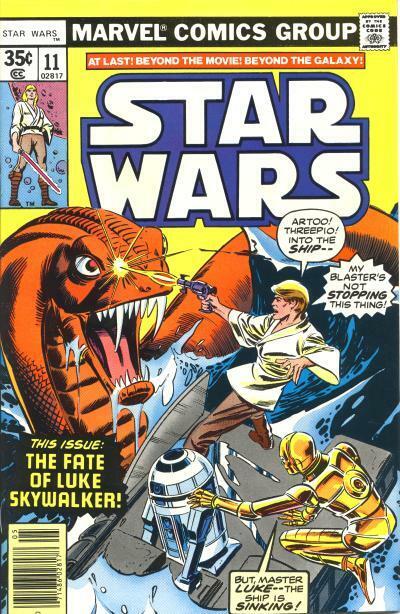 We know Carmine Infantino produced more covers for the Star Wars Weekly comic, so it is possible this was entirely new artwork just for this book. This artwork was re-used by the publisher Siam Sports Publishing for their Thai translation of the Star Wars movie adaptation. Star Comics Magazine #5 is the final issue in the anthology digest to contain an Ewoks reprint. It reprints Ewoks #5. 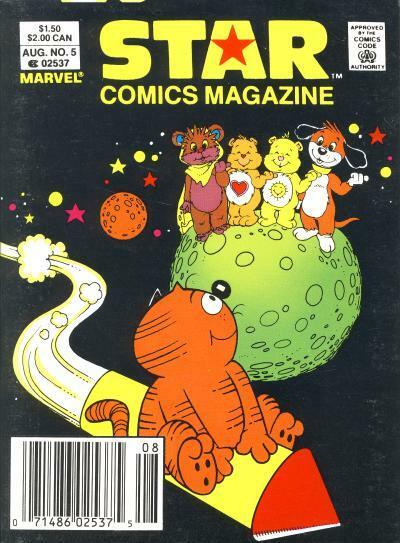 Star Comics Magazine #5 contains reprinted stories for Heathcliff, Top Dog, and the Care Bears in addition to Ewoks. The cover shows Heathcliff riding a rocket past an asteroid containing Wicket, a pair of Care Bears, and Top Dog. The San Diego Comic-Con started out as the Golden State Comic-Con in 1970 and drew approximately 300 people. In 1972 it was named San Diego's West Coast Comic Convention and in 1973 it settled on the name San Diego Comic-Con when attendance broke 1000 people. By 1995 the attendance had grown to over 30,000, with attendees coming from around the world. That year, the convention changed it's name to San Diego Comic-Con International and the familiar convention logo debuted. In the early years, this convention's focus was comic books. But, as the number of attendees grew (in 2015, the convention drew over 150,000 attendees), the focus shifted to include not only comics, but video games, movies, television shows, animation, toys, and other entertainment items; it now showcases any form of pop culture entertainment. In recent years, events at the convention have been broadcast for non-attendees to view. For many comic fans, the loss of focus on comic books has been noticed and long time convention dealer Mile High Comics has decided to not setup a booth this year due to the dwindling number of comic book enthusiasts attending the event each year. Despite the convention's focus shifting away from comic books, most comic publishers still setup booths at this event. 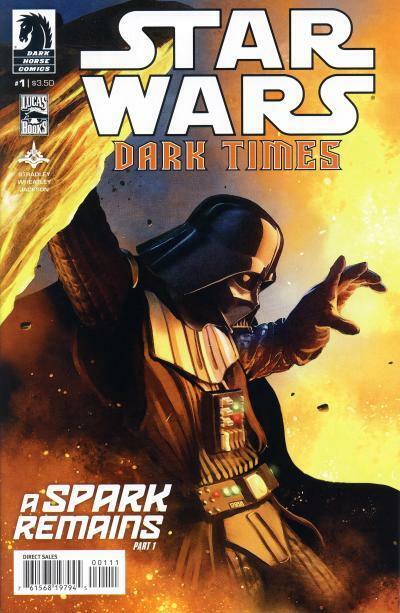 At the 2013 convention, Dark Horse distributed a convention exclusive version of Dark Times - A Spark Remains #1. The convention version of the comic book uses the same art. It is a closeup of Vader with the artwork pixelated. The Classic Comic Con takes place from October 27 - 29 in Modesto, California. Despite being a few months away, a Classic Comic Con exclusive is already available to purchase. Legends Comics of Fresno has joined with the convention to publish a Darth Vader #1 exclusive. This comic is limited to 3000 copies. Preliminary numbers show Darth Vader #1 as the 3rd best seller for the month of June. Please visit Comichron and read the posting June 2017 sales down against giant Rebirth month from last year; Spectacular Spidey snags top spot. 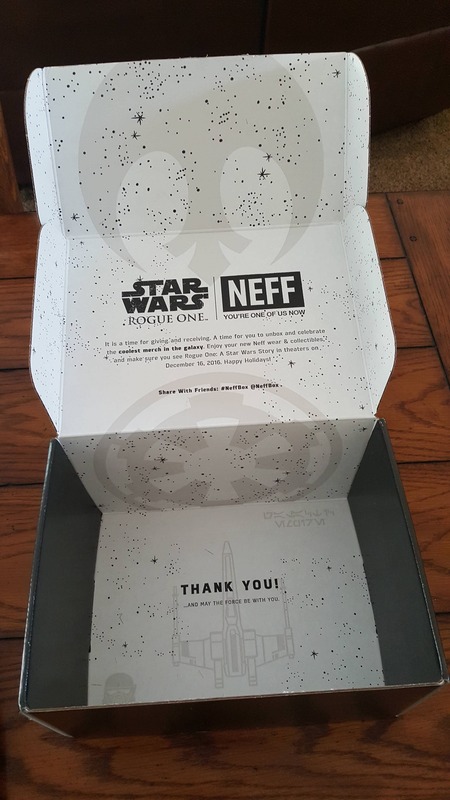 I completed my July order using Discount Comic Book Service (DCBS) but I noticed IDW's Star Wars: The Force Awakens Graphic Novel was not included in their listing. I sent email to DCBS and they added this graphic novel to my order. Since this graphic novel is being published in time for Force Friday II on September 1st, I'm sure there will be plenty of copies available. But if you are like me, and order your new books off an Internet retailer, you may want to ask them to add this item to your order if they don't have it listed. Dass Jennir is a human male Jedi Knight who survived Order 66. 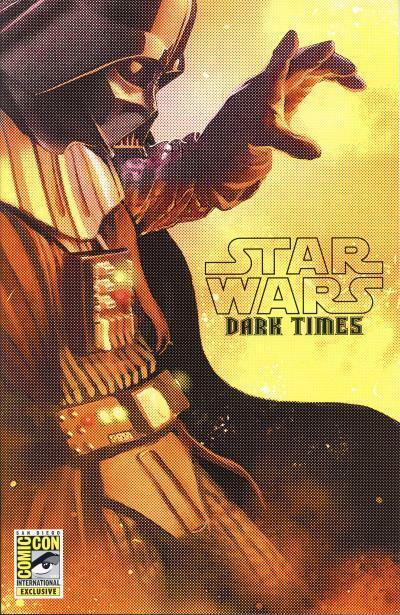 His exploits after the fall of the Republic are told in the Star Wars: Dark Times titles. Some Star Wars fans familiar with the title might be surprised to learn Dass' first appearance is not in Dark Times #1, but in Star Wars: Republic #79. 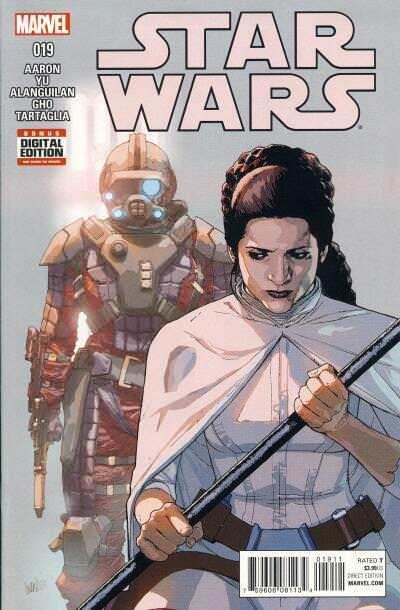 Star Wars #79 is the first part in the two part story arc Into the Unknown. The story follows two Jedi, Master Kai Hudorra and Knight Dass Jennir, immediately after Order 66. Each start on a different planet and have to evade capture by the Empire to reach Coruscant for answers. On Toola, Master Kai Hudorra is joined by Padawan Noirah Na and, after some close calls with the Empire, are able to book passage to Coruscant. On New Plymto, Dass Jennir encounters the Nosaurian Bomo Greenbark while escaping from his troops. Dass learns that he and his troops were deceived about the reason they were fighting the Nosaurians on New Plymto. The leader of the Nosaurians, Commander Rootrock, provides Dass with a ship to return to Coruscant. On Coruscant, both Jedi are part of a crowd watching the Jedi Temple burn and witness a Jedi get gunned down by the Empire's soldiers. The two Jedi meet and Kai Hudorra decides to go into hiding, while Dass Jennir decides to return to New Plymto and help the Nosaurians. It is clear from reading the story, it was meant to be a standalone two part arc without a followup. 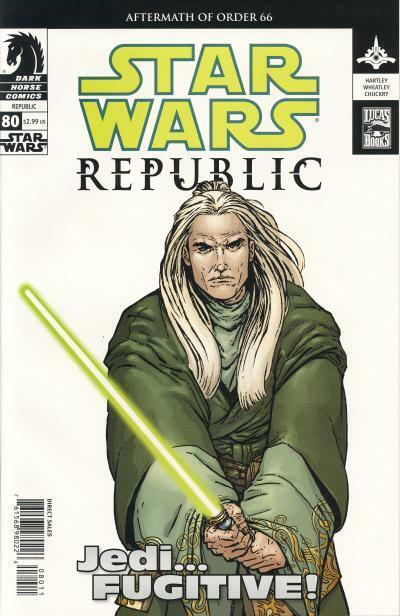 The remaining two issues in the Republic title provide an ending for Jedi Master Quinlan Vos' story. A year after Star Wars: Republic #79 is published, Dass Jennir and Bomo Greenbark would return. 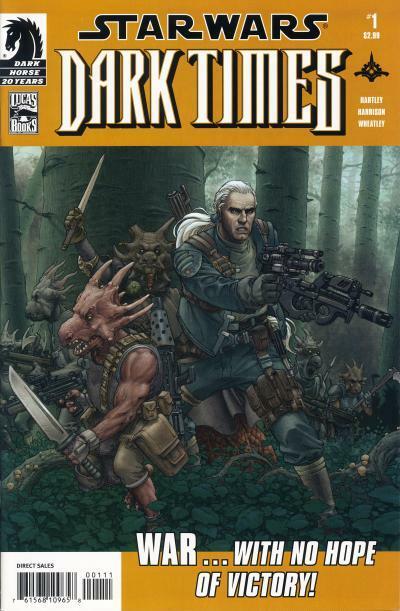 Despite having no plans for the characters outside the two issues, Star Wars editor Randy Stradley and artist Doug Wheatley decided to use them in the new title Dark Times. Doug Wheatley provides the artwork for all the story arcs that Dass Jennir appears. The Dark Times series within a series only has 33 issues despite being published over a 7 year period. Darth Vader #1 is getting a 2nd print. This new printing is scheduled to be in stores July 26. The Electric Company was an educational children's television series that was in production for six season from October 1971 through April 1977 for a total of 780 episodes. The show, which aired on PBS along with Sesame Street, was aimed at older children than those who watched Sesame Street and the most famous cast members are Bill Cosby (from the first two seasons) and Morgan Freeman. The reason most comic fans remember the show is due to Spider-Man's re-occurring appearances starting in 1974. The Spider-man segments were made to look like comic books complete with panels. While other characters talked, Spider-Man never spoke but instead communicated through speech balloons which furthered emphasized the comic book angle. The same year Spider-Man began appearing on The Electric Company, Marvel Comics began publication of the Spidey Super Stories title based on the character on the show. For children of the 1970s, the show ran longer because it played in reruns for another 8 years through October 1985. The Marvel comic was published from October 1974 through March 1982. Marvel's Spidey Super Stories #31 and Archie's Mad House Comics #111 both have a cover date of February 1978 and are the earliest non-Star Wars pamphlet-sized comics with a Star Wars reference on the cover. The following month in March 1978, Howard the Duck's famous 2-part Star Wars parody starts in his namesake title's 22nd issue. What makes Spidey Super Stories #31 stand out is the full-length story, Star Jaws. 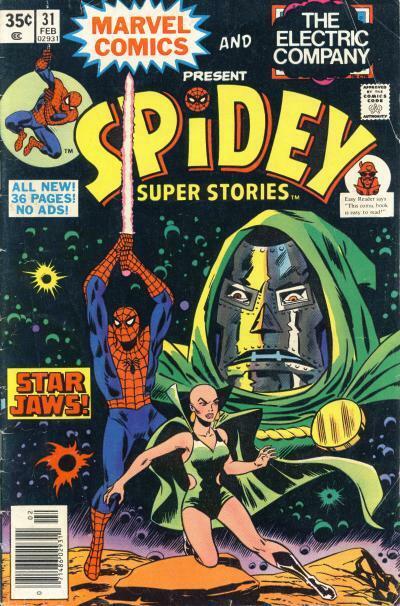 Star Jaws is the name of Doctor Doom's Death Star like space station that he built to eat the Earth. 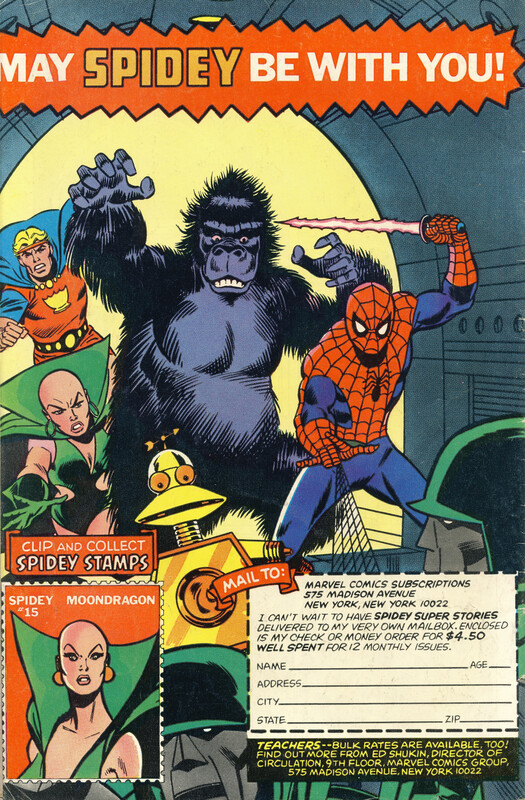 It is up to Spider-Man, Marvel Boy, Paul the Gorilla (a character on the Electric Company who is the Chewbacca stand-in), and Sam the Robot (a character from Sesame Street and the droids stand-in) aboard the Millennium Falcon to rescue Moondragon and destroy Star Jaws before Doom's plan succeeds. Doombots serve as Stormtroopers in the story and they fly spacecraft that are smaller versions of the Star Destroyers. We are even treated to a Doctor Doom versus Spider-Man lightsaber battle! The cover is based on the Tom Jung and Hildebrandt brothers posters. Spider-Man is in Luke Skywalker's pose while Moondragon is standing in for Princess Leia. Doctor Doom's visage is used in place of Darth Vader. The back cover shows the heroes from the story. A blurb borrows Star Wars' famous line May the Force Be With You and reads May Spidey Be With You. 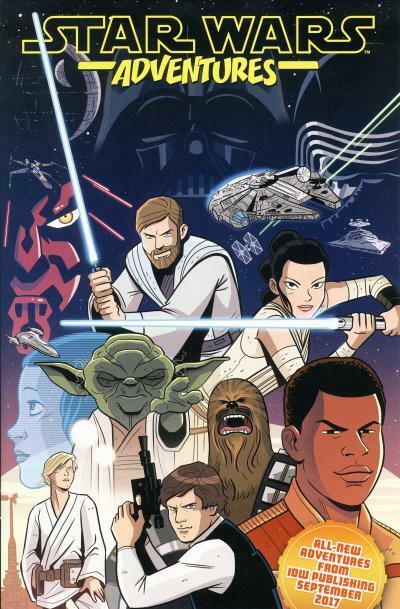 Last week, an ashcan of the Star Wars Adventures title from IDW began showing up at comic shops. The story is narrated by C-3PO and R2-D2 who introduce glimpses of story arcs about Luke Skywalker, Asajj Ventress, Padme Amidala, Finn, and Han Solo, Princess Leia, and Chewbacca. This consumes 8 pages and another 4 pages are ads for this title with the remaining pages containing ads for Disney based titles. The art looks very similar to the Dark Horse Star Wars Adventures title. The first two stories look like they will be based on characters introduced in The Force Awakens with the first centered on Rey and the second revolving around Finn. It is nice to see the Poe Dameron comic will be joined by more comic stories from this new era. 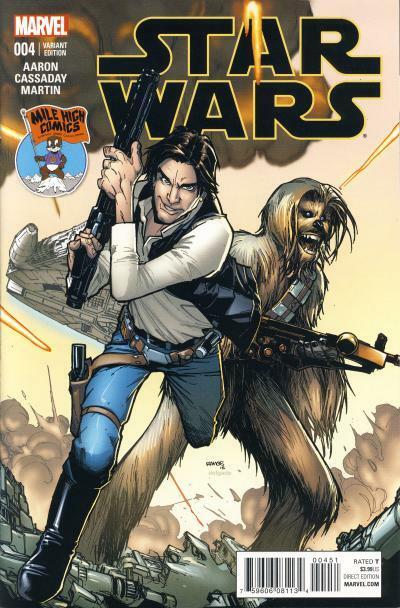 In August 1999 Dark Horse published two version of Star Wars #0, one for the online retailer AnotherUniverse.com and another for AnotherUniverse.com's mail order company, American Entertainment. 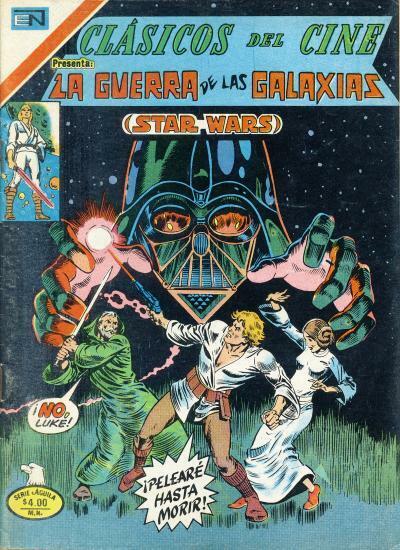 Star Wars #0 reprints the story The Keeper's World from the comic strip in Pizzazz #1 - 9. The cover artwork for the AotherUniverse.com exclusive is provided by longtime Star Wars artist Dave Dorman. 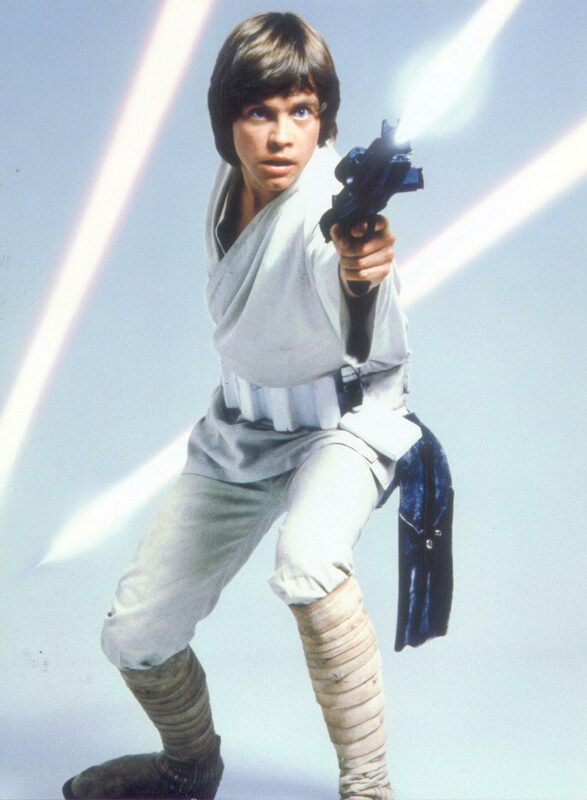 Dorman's inspiration for the drawings of Luke Skywalker and Princess Leia are clearly based on well-known publicity photos for the first movie. 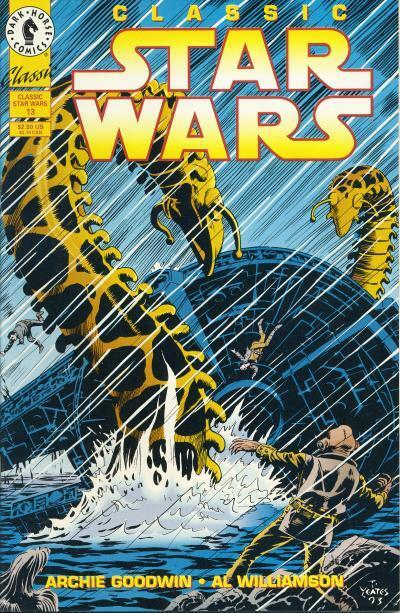 The image of our heroes being attacked in water by giant serpents-like creatures is a trope in Star Wars stories. 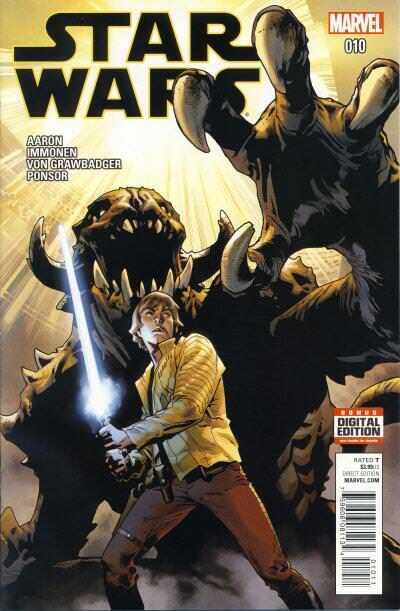 The first time this occurs is toward the end of Marvel's Star Wars #11 with a cover date of May 1978. Luke Skywalker, C-3PO, and R2-D2 crash on the water covered planet in the Drexel system. Their wrecked spacecraft is attacked by a giant sea-dragon. They end up escaping the sinking ship in an escape pod while the sea-dragon continued its assault on the doomed craft. These sea-dragons are integral to the Dragon Lords story arc in Star Wars #11 - 15. The next time our heroes encounter a giant serpent is in the Star Wars Holiday Special which aired on CBS on November 17, 1978. During this live-action special, an approximately nine minute cartoon shows Luke, C-3PO, and R2-D2 landing their Y-Wing Fighter in a liquid substance very much like molasses on a moon in the Panna system. The Y-Wing is attacked by a giant serpent-like creature forcing Luke to eject the cockpit from the craft. This story is notable for introducing Boba Fett who arrives riding a dinosaur-like creature and chases off the first creature. 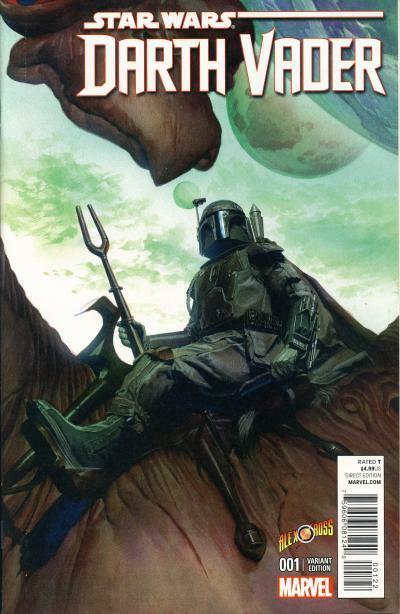 Boba Fett riding on the larger creature is captured on the Darth Vader #1 Alex Ross Store exclusive cover. In The Empire Strikes Back, released in May 1980, Luke crashes his X-Wing Fighter in a bog on Dagobah. As Luke reaches shore, R2-D2 is swallowed by a dragonsnake which find the droid inedible and spits R2-D2 out. Unfortunately, this scene was not included in The Empire Strikes Back comic adaptation, but Dark Horse does expand on the incident by concocting another tale about the dragonsnake. 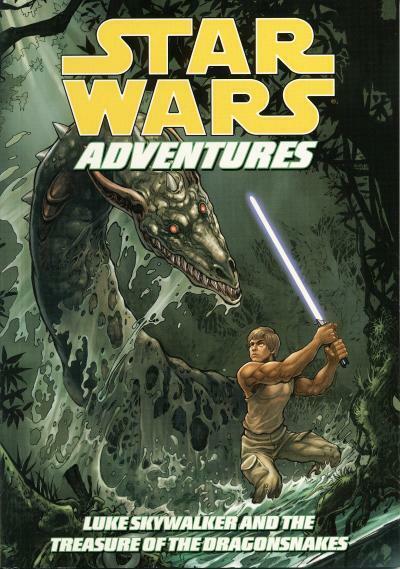 During Luke's time on Dagobah, Luke has more adventures than what is show in the movie, and the story about the King of Dragonsnakes is told in Star Wars Adventures: Luke Skywalker and the Treasure of the Dragonsnake. In the newspaper strip arc, Revenge of the Jedi, published between November 15, 1982 and January 23, 1983, Han Solo and Princess Leia retrieve Luke from the planet Hoth in the Millennium Falcon and embark on a mission to persuade the Rebellion's newest allies, the Mon Calamari, to provide a diversion so they can relocate the Rebel base from Yavin to Hoth. Near the planet Daluuj, they discover a debris field left by a recent battle between the Empire and the Mon Calamari. Several Mon Calamari, including their leader Admiral Ackbar, escaped the battle in escape pods and the Millennium Falcon heads down to the mud planet Daluuj to rescue Ackbar. Our heroes spot the Mon Calamari and set the Falcon down in a mud lake and the ship is swiftly attacked and dragged to the bottom by giant worms. This story arc is notable for introducing the Mon Calamari and Admiral Ackbar before Return of the Jedi and is reprinted by Dark Horse in Classic Star Wars #13 and 14. 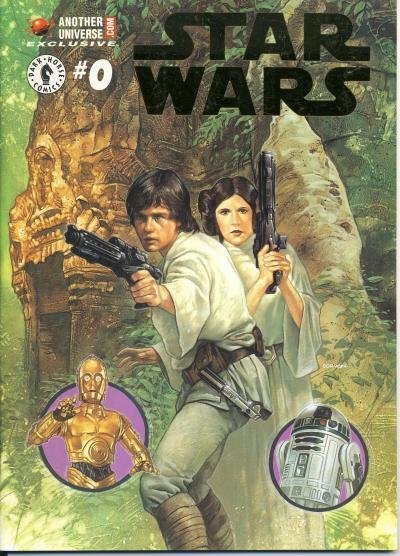 In Star Wars #76, cover dated October 1983, Luke, Leia, and Kiro are tending to the dead and wounded after a missile from the Imperial-controlled planet Gamandar explodes on the water covered planet Iskalon. While on a wrecked landing platform on the surface, they are attacked twice by a serpent-like Chiaki which is drawn to the site by the blood. During the first attack, one of the creatures is driven off by Kiro and in a second attack, Lando Calrissian kills one of the creatures using the Millennium Falcon's gun turret. 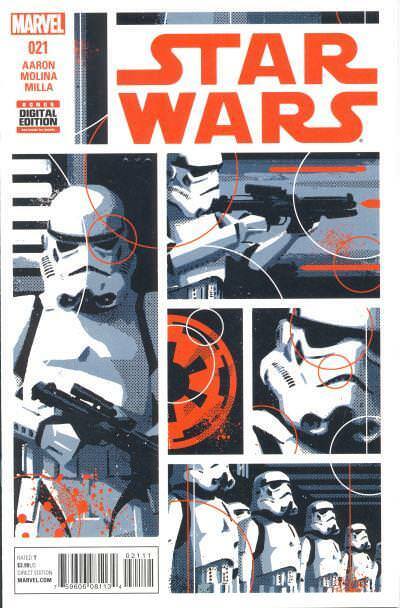 Mile High Comics has impressively released an exclusive cover for every issue of the main Star Wars titles to date. The first six exclusive covers are drawn by Humberto Ramos and interlock to form a larger piece. A few days back, I mentioned that all the Photobucket images were broken in this blog. Photobucket decided to change the terms of their service without notifying me and for a mere $400 they were willing to fix the issue. Since $400 is no small amount for a blog I make no money from, I decided to move all the images to Imgur. Since I've been experiencing Photobucket issues on and off for over a year, I had already started using Imgur for newer images starting back on March 16th and have been very pleased with the service. As one door shuts, a new door opens. I'm happy to report that I only have about 200 more images to move to Imgur and this blog will be completely off Photobucket. I've been fixing links in the postings as I go. I expect to have all the images in the postings fixed in the next day or so. But that will still leave the Cover Galleries with broken thumbnails. I will start working on them next, but I'm not eager to tackle them with the same vigor I did the images in the postings. I'm planning on taking up to a month to fix the thumbnails so I can get back to making frequent postings. I apologize for the trickle of new postings the past few days, but I thought it was important to restore the existing postings first. 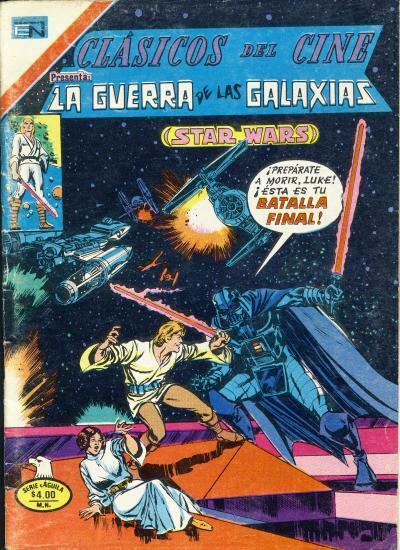 The Star Wars movie translation was published for Mexican readers in Clásicos del Cine #299 - 302. Since it was published in four issues instead of six like in the U.S., each issue contains one and a half U.S. issues. The covers used for the Mexican issues are those for the complete issues inside which are the covers for issue #1, 3, 4, and 6.